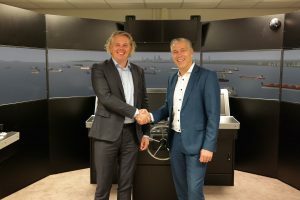 Falck Safety Services and Simwave are joining forces to serve the maritime and oil and gas industries with combined simulation and practical training. For more than 30 years, Falck Safety Services has offered safety training for the offshore, maritime and wind industries. On 8 November, Simwave will open its doors to the most advanced maritime simulator centre in the world. This co-operation means that customers will be able to undertake simulation training at Simwave to complement the training at one of the training centres of Falck Safety Services. Simwave boasts 59 simulators at the brand-new Barendrecht site, including two full mission bridge simulators. One of these is equipped with a unique ‘floor projection system’, including two integrated bridge wings as part of the wheelhouse. This simulator also features a so-called cockpit bridge set up, which is frequently seen on passenger ships such as cruise ships and ferries. In addition to various smaller simulators for tugs, offshore supply vessels and inland waterway ships, an engine room simulator will be available. Like the two bridge simulators, it will be spread over two floors. It is not only the diversity of simulators that makes this centre unique, but also the fact that all simulators can be linked. Multi-discipline scenarios can be executed, where people working in different areas on a ship or offshore installation can train together as a unit. Simwave and Falck Safety Services are seamlessly integrated in the multidisciplinary execution of scenario training. Falck Safety Services has over ten years specialist experience in training complete teams working on offshore installations and ships. Scenario training also offers the opportunity to combine practical training and simulator training, resulting in significantly reduced training time. The exercise centre at Maasvlakte-Rotterdam and the Simwave simulation centre in Barendrecht are only 30 minutes apart. However, training sessions may also be followed at the Falck Safety Services centres in Amsterdam and Den Oever or, if possible, at the customer’s premises. The co-operation covers all mandatory STCW (shipping) and OPITO and NOGEPA (offshore) certified safety training. The new Falck exercise centre, which is expected to be operational in the second quarter of 2018, will see increasing use of computer simulation, aligning the training modules offered by Falck Safety Services and Simwave even further. “Ships are becoming increasingly sophisticated and more and more is expected from crews. To run a ship safely and efficiently, training the crew is essential. To this end, we adopt an integrated approach of bridge, engine- room and cargo handling. Thanks to the co-operation with Falck Safety Services, we are able to offer tailor-made products and services in the maritime domain for each subsector, as well as a total solution. It also allows us to share specific knowledge. This is also cost-effective for shipping companies,” says Joost van Ree, commercial director and co-founder of Simwave. “Falck Safety Services already uses computer simulation for crisis management training and STCW scenario training. We are very pleased that, thanks to the co-operation with Simwave, we can extend our complete portfolio of mandatory offshore and maritime training courses. Through this training method, we can offer participants even better insights into the risks on board, thus helping to prevent incidents and we can train them in the most effective and efficient manner’’, according to Paul Boumans, commercial director of Falck Safety Services Nederland.